If you follow this blog’s cocktail companion, Sips & Shots, you already know that this past Saturday was National S’mores Day, and since 1/3 (or maybe even a full half!) of a s’more is the graham crackers, what’s a low-FODMAPer to do but make their own! While I could look for a pre-existing gluten-free graham cracker recipes, I wanted to try the theory that my favorite flour blend would truly work in any given recipe. So I went with the first Google result: the Smitten Kitchen’s Graham Crackers. Did it work? In spades, my friends, in spades! Combine the flour blend, brown sugar, soda, gum, and salt in the bowl of a food processor and pulse to combine, or stir together in a large bowl. Add butter and process until the butter has been reduced to small bits among the flour and resembles coarse crumbs or cut it in with a pastry blender or two knives–your standard pie-crust or biscuit method. Stir together the syrup, milk, and extra and add to the processor or stir into the bowl until a soft, uniform, very sticky dough forms. Wrap dough in plastic wrap and chill for at least 2 hours. Flour your work surface with your wheat-free flour of choice and use plenty–this is a very sticky dough! I prefer white rice flour since I can get it in larger amounts at the Indian market, it’s got a fine, grabby texture and won’t change the texture or flavor of the baked goods. Roll out the dough to somewhere between 1/4 and 1/8-inch thick and cut into squares for the traditional graham cracker style or rounds (or any other shape you want) if you’d like to make your own moon pies and such. Dock each cracker with the tines of a fork, a skewer, or toothpick. Docking keeps the crackers from puffing too much, you want them to stay fairly flat and compact, so don’t skip that part. Transfer to a baking sheet lined with a parchment paper or a baking mat and sprinkle with sugar or cinnamon-sugar. Bake for 20 minutes at 350Â° F. Makes a bit more than 2 dozen 3″ square cookies. 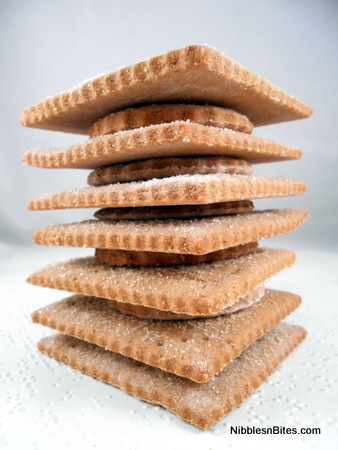 The distinctive flavor of a graham crackers seems to come from the combination of molasses (from the brown sugar) and vanilla, so you want to make sure the quality of these ingredients are fairly high. The Smitten Kitchen recipe called for a mild honey, but that’s naturally high in fructose so not a good option for a Low-FODMAP indulgence. Since I was substituting maple syrup, I dropped the dark brown sugar to light just to keep things more or less even. And if there was ever a time to bust out the premium vanilla, this recipe is it! For me it was a bottle of Neilsen-Massey Organic Fair Trade Madagascar Bourbon vanilla extract that I received for review. The Neilsen-Massey vanilla is subtle but lovely in a recipe like this that depends on basics, not show. What amazed me about this recipe came the day after they were baked. The next day I opened the cookie jar to immediately be hit with that quintessential graham cracker aroma and it was amazing. Add to that the perfect texture and flavor–these grahams made for excellent s’mores and even better snacking–not too sweet, just sweet enough.